Printed Circuit Board Custom Design & Manufacturing Benefits - EMC Technologies Inc. There are many advantages associated with creating custom test solutions for industry. A functional test interface that has been designed and manufactured specifically for your needs will always perform better than some “off the shelf” model. 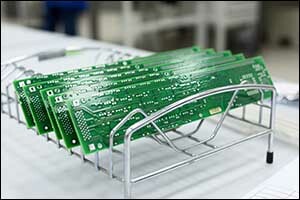 Custom design and manufacturing of printed circuit board (PCB) also offers many benefits. Electronics builders and industry leaders alike have discovered the advantages of using a custom PCB compared to a prototype. EMC Technologies works with each client to determine their unique and specialized needs, working together to create a custom printed circuit board design that checks every box for truly professional results. While they say that looks aren’t everything, when it comes to the custom design and manufacturing of a printed circuit board, it can make a big difference. Most professional boards are designed in software, which is used to arrange all of the required parts for best performance. Working with experienced engineers helps to maximize the benefits even further, creating parts that are spaced out evenly and traces that are uniform and symmetrical. Company logos and other identifying marks can be added to the board as well, creating a polished finished appearance. As consumer electronics get smaller and more compact, the need for smaller printed circuit board solutions grows as well. Custom test solutions for functional test interface is one thing, but when a client requires a custom printed circuit board to work within a small enclosure, EMC Technologies can help. Our custom design and manufacturing of PCBs can help to meet space constraints, create odd-shaped boards for unique products, and can be exactly the size you need to produce a professional-looking result. When our clients work with us in the custom design of PCBs for a specific need or challenge in extreme conditions or unique requirements, we can achieve amazing results. While most well-made prototypes are rugged enough for basic testing, custom printed circuit board designs will always be far superior, offering many other benefits. The durability and functionality of a custom printed circuit board also features copper conductors that include soldered in wiring and the ability to add specific holes for screws and other mounting hardware for a perfect fit. While it will cost more for custom design and manufacturing of custom printed circuit board solutions, it is ultimately much more cost effective as the quantity of PCBs goes up. Printed circuit boards are essential for many of today’s consumer electronics and other industry-specific solutions. The more printed circuit boards made with this custom design, the more valuable it will become. This is why many of our clients work with us directly for custom test solutions and other contract services to improve the quality of their finished product and make it more effective, affordable, durable, and specific to their needs. Our facility in Fall River, Massachusetts includes a fully equipped machine shop and electro-mechanical assembly department. Our team of engineers and technicians have the capability to manage even the most demanding requirements to meet the needs of our clients. Our staff includes mechanical, electrical, and printed circuit board (PCB) engineers and technicians, who all work with the latest design tools and equipment. Even our sales team is comprised of experienced sales engineers, applications engineers, and technical project managers to help get each order off on the right foot for custom test solutions. We provide our customers with a single point of contact. Our project managers work to coordinate and ensure communication between the client and our sales, design, engineering, and testing departments. We find that this helps to ensure that every project runs smoothly and efficiently to provide a satisfactory experience. Every single member, from the sales department to final testing, receives continuous training to ensure that they are experts in the ever-changing technologies required within the functional test interface industry. Our customers consider EMC Technologies to be a partner in their test challenges and we take pride in the loyalty that we have earned over the years. Smaller targets, faster speeds, new technologies, and more company outsourcing are just a few of the challenges that we face together with our customers as the need for custom test solutions evolves. We work hard every day to listen to our customers, seek and develop the best talent available, and continue to invest in technological advances. If you would like to learn more about our custom design and manufacturing of functional test interface solutions and printed circuit board products, give us a call at 508-672-0808 and speak with one of our knowledgable and experienced sales engineers.